Protect people from uneven walkways and mezzanine drop off's. 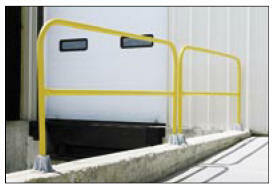 Safety railings are available in 2 constructions, aluminum and steel. The steel models have a schedule 10 pipe construction while the aluminum models are made of schedule 40. All models have an outside pipe diameter of 1-5/8”. 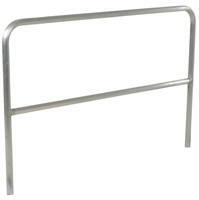 Handrails are 42" high with a 21" mid-rail. Mounting options include socket sleeves, cast steel base, barricade base, or cast steel sockets for convenient handrail removal. The cast steel sockets accept wood 2" x 4" or 2" x 6" when toe boards are required and two (2) lag down holes for permanently mounting the railing. 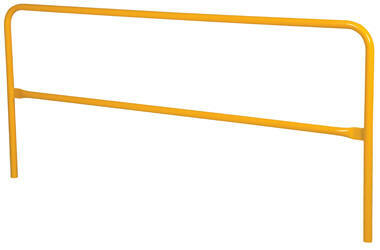 VDKR has a yellow baked-in powder-coated toughness. VDKR & ADKR series pipe railings satisfy federal OSHA requirements for standard guard rails in 29 CFR 1910.23. Single & Double Sockets accepts wood for toeboards.